If you live around here, you’re very likely sitting beside the fire today. It’s below freezing with 20 mile an hour winds. And snow. Lots of it. I woke up early this morning and stared out the window at the sideways blowing snow for a couple hours drinking my coffee. I missed running on Saturday to recover from Friday night’s poker game. I couldn’t miss today too. After my third cup, it came to me. This was my chance to wear the balaclava I got for Christmas. I dressed warm but tried hard not to wear anything too heavy. I took a risk not wearing snow pants. But I was good with knee-high compression socks and Under Armour long-johns covered by a loose fitting pair of running tights. The second pair being a bit loose would allow for an air pocket to trap warmth. I also wore my high top pair of gaiters to protect my trail running shoes – which are not waterproof. Up top I layered first in a compression turtle neck, then a light Under Armour Cold Gear top followed by a thin long-sleeved fleece and my North Face wind breaker shell. The final pieces were running mittens, a thick running cap, and my new balaclava. 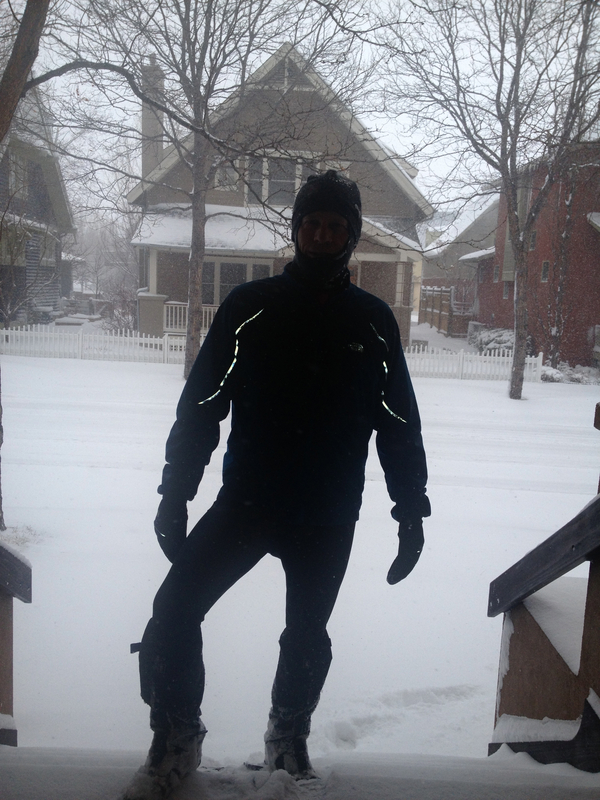 The Chinook winds were rather fierce right outside my door but I was dressed properly to handle them. After a mile or so the wind was mostly at my back. I began to warm up at that point and pulled the balaclava down around my chin to free up my breathing. 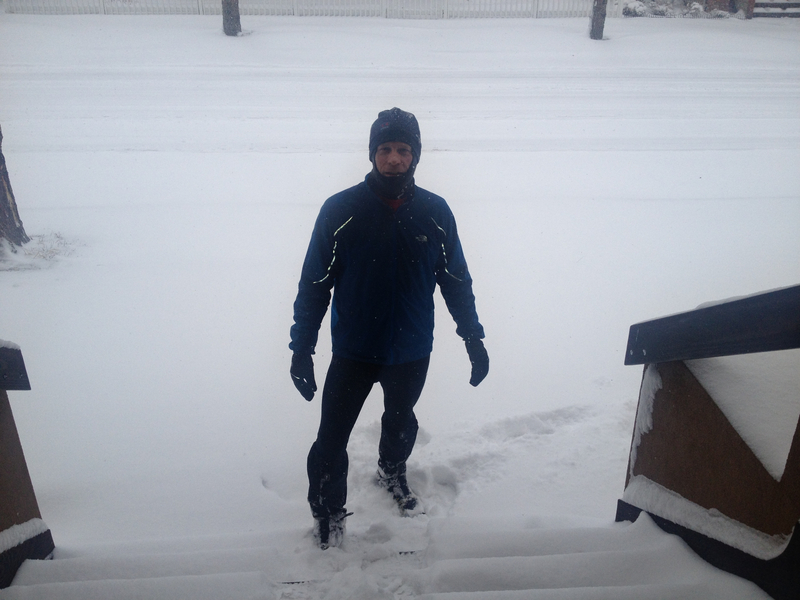 I had hopes of getting in ten miles but was prepared to run as few as three or four if the weather was too extreme. The determining factor turned out to be the snow drifts. Some parts of the Lobo trail were wind swept while others were buried. The deep snow fatigued my feet and calves. Not sure why exactly but the snow gave my arches a workout. It was slow going for sure. I turned around after 3.5 miles for a seven mile run. This is where the LoBo Trail hits 83rd Street. My turn was a bit wide and my right foot landed on the slope of the irrigation canal that was hidden under snow. Mahoney down! I was lucky though as I maintained balance and did the equivalent of a one legged squat dropping down on my left leg with my other leg splayed wide right. My gloved hands hit the ground too but not hard enough to break a wrist or anything. The stretch tweaked my groin but it doesn’t feel strained now. Close call. The run back was mostly into the wind. Not ideal. I pulled the balaclava back up over my mouth. My glasses froze over and I had to pocket them. The snow stung my eyes a bit from the force of the wind but visibility was still better without my glasses. My tracks were mostly covered up from the blowing snow. Still, I was warm and had a nice run. I was back home by 11:30am. Showered, warm by the fire, I’ve just lunched on the remains of my lamb stew I made last Sunday. I’m either going back out for groceries or perhaps taking a nap. Sounds like an epic run!